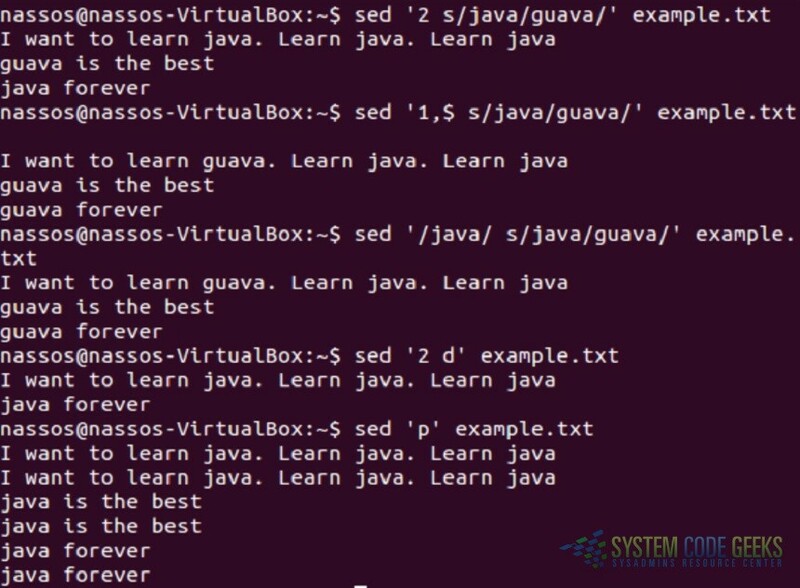 In this post, we feature a comprehensive Linux sed Examples. Sed is basically a stream editor used for modifying files in unix or linux. It provides a nifty way to perform operations on files which can be passed around through pipes. Most people never learn its real power, they just simply use sed to replace text. You can do many things apart from replacing text with sed. As mentioned earlier, sed is an editor that allows us to use pattern matching to search and replace within a file, or an input stream. This works by using Regular Expressions. By default, the results of any edits we make to a source file, or input stream, will be sent to STDOUT, the standard output. The original file will be unaffected by the edits. Also the sed command can be incredibly useful when bootstrapping a new server, or machine, as it can easily be scripted. A common use case for sed is to script the editing of configuration files on a new server instance to facilitate the further setup of the needed environment for that machine. Here the “s” specifies the substitution operation. The “/” are delimiters. 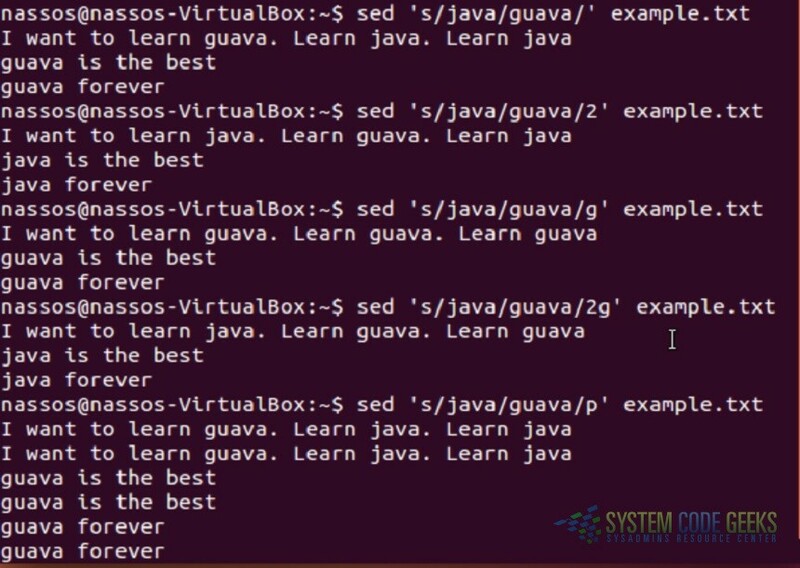 The “java” is the search pattern and the “guava” is the replacement string. By default, the sed command replaces the first occurrence of the pattern in each line and it won’t replace next occurences. You can specify a pattern to the sed command to match in a line. If the pattern match occurs, then the sed command looks only for the string to be replaced and if it finds it, then it replaces the string. 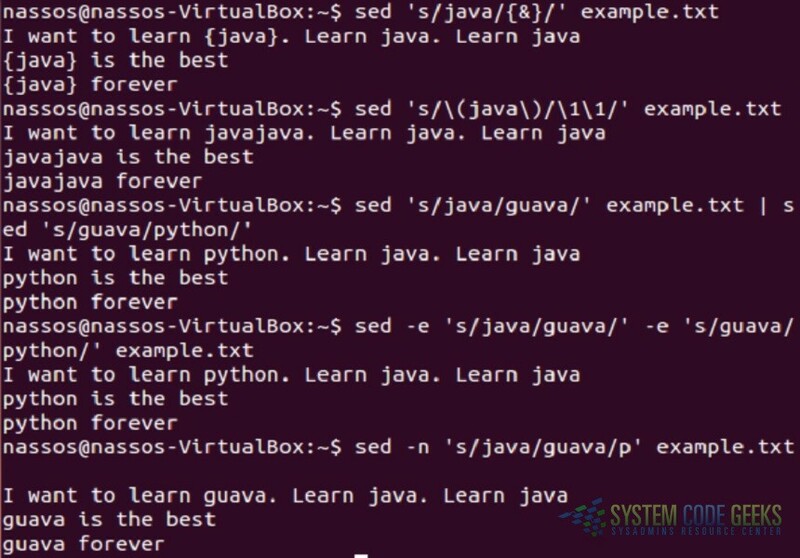 Here the sed command first looks for the lines which have the pattern “java” and then replaces the word “java” with “guava”. 17. Adding a line after a match is found. 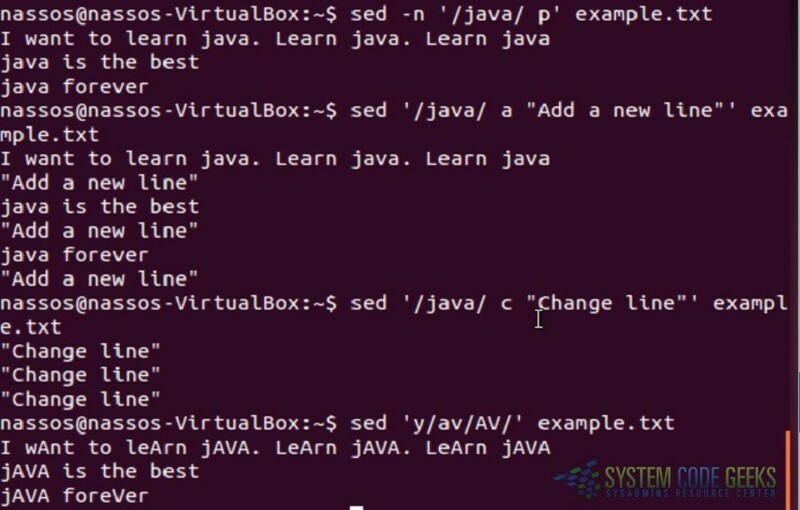 The sed command can be used to replace an entire line with a new line if a match is found. The “c” command to sed tells it to change the line. In example 3, you say the /g replaces all occurrences of a pattern in a line, but your screen output shows java is replaced on all three lines of the example text file. Did you mean to say file instead of line? Then, in example 4, you say from the nth to all occurrences of a pattern in a line, and the output shows only the 2nd and 3rd occurrence of java is replaced. Does this mean that /g is only global to a line when used in conjunction with another flag? In the line means in each line, sorry if it was confusing, so for example 3 the global flag replaces all occurrences of the pattern in each line of the file. In example 4, 2g means replace the pattern in each line from the second occurrence and onwards. So it replaces the second and third occurrence in the first line, but nothing on 2nd and 3rd line as there is only one occurrence of the pattern in lines and 3.